In the United States, only 20 percent of the cut flowers sold are grown in the country. 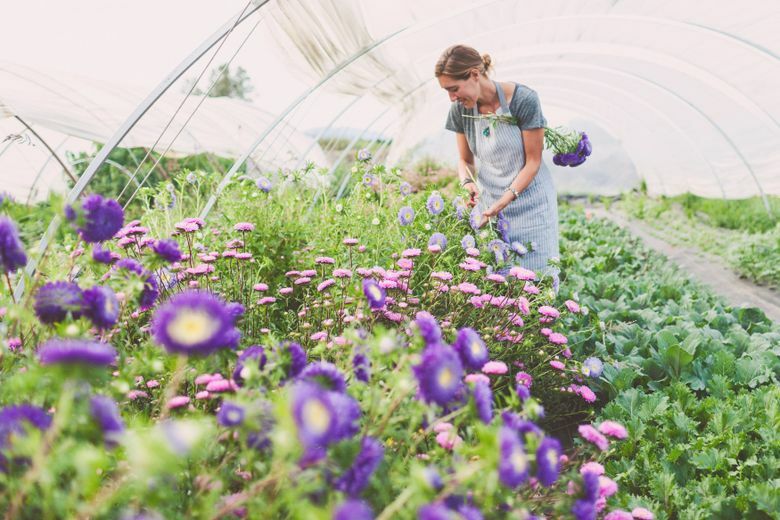 Northwest flower farmers are looking for ways to make money at work they love. THE TULIPS AND ROSES in buckets outside the grocery store are tempting … but were they grown locally? Probably not. Most of those pretty flowers have been sprayed with pesticides, preserved in chemicals, picked by underpaid laborers and shipped thousands of miles to end up at Seattle markets. According to a recent article in Modern Farmer, only about 20 percent of cut flowers sold in the United States are grown here. Look for the “Certified American Grown” label to make sure you’re not buying flowers shipped in from Colombia or Japan. If we’re going to have a choice of local flowers, the question is … is it possible to make a living farming flowers? Can Northwest organic growers compete with imports? I asked these questions of whirlwind Diane Szukovathy, co-proprietor with Dennis Westphall of seven-acre Jello Mold Farm near Mount Vernon. “The short answer for us is yes,” she replied by email. Szukovathy credits the Seattle Wholesale Growers Market cooperative as instrumental in their farm’s success. They tried selling at area farmers markets but found flower prices too low to make it worthwhile. Now they sell 90 percent of what they grow at the cooperative, where the main customers are florists, grocery stores and other businesses. “We had to start a co-op to make it pencil out because, as just farmers (not farmer-florists), we needed the gained efficiency of selling with other growers,” says Szukovathy. Katherine Anderson is another hardworking farmer. She runs four flower-related businesses — The London Plane in Pioneer Square; Marigold and Mint, the shop on Capitol Hill; Marigold and Mint, the farm; and a botanical soap and candle line. 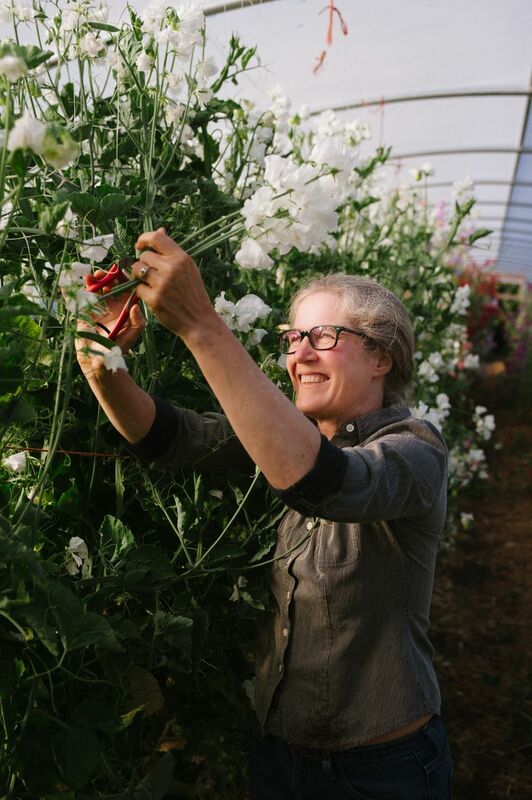 Anderson grows directly in the field, without hoop houses, at her 1-acre farm along the Snoqualmie River. She begins harvesting narcissus in mid-March and continues with dahlias and sunflowers into early October. She grows mixed heirloom berries (raspberry, thornless blackberry, tayberry, loganberry, marionberry) for use in arrangements. She sells all of what she gathers and harvests to her two shops, and they use every bit of it. This year, she has scaled back a bit in order to reassess the right combination of time on the farm, varieties to grow and how much acreage to farm. 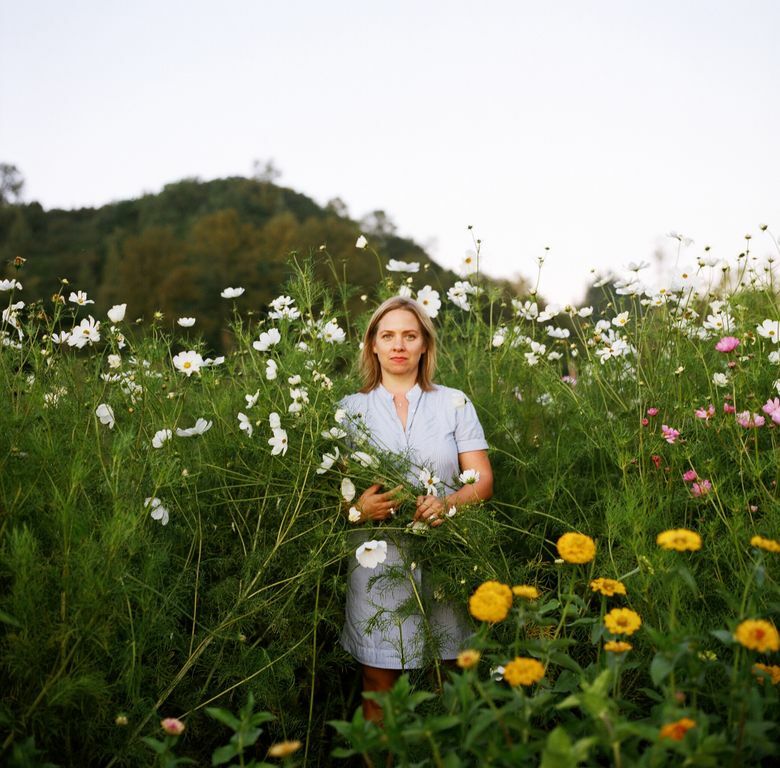 “My flower farm is the soul of my larger group of businesses, and so success for me is being able to grow and experiment with plants and flowers that I’m excited about,” says Anderson. Florists and farmers come from around the world to take Erin Benzakein’s sold-out workshops at Floret Flower Farm in the Skagit Valley. Floret is known for fluffy, romantic flowers, like sweet peas, Iceland poppies and dahlias, snapped up by its largest customers: Whole Foods, Metropolitan Market and Full Circle Farm CSA. “We really worked to extend into the shoulder seasons,” says Benzakein. With 11 hoop houses, they’re first into the market in springtime, when people want flowers the most. She says flower farming is very hard work. “But flowers make more per acre; they’re one of the most profitable crops you can grow,” she says. And proves it.